Dr. Ashley Shew serves as an Assistant Professor of Science and Technology in Society at Virginia Tech. She locates her work in philosophy of technology with special interests in emerging technologies, animal studies, and disability studies – socially relevant topics! Her first book, Animal Studies and Technological Knowledge, will come out in 2017 (Lexington Books); in it, she argues that the use of tools by animals can be considered within frameworks of technological knowledge. Her current research focuses on technology and disability and relates strongly to her teaching and outreach activities. 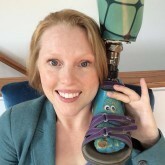 A hard-of-hearing amputee, Ashley’s personal encounters with technologies of body and ideas about what it means to be a good disabled person have motivated much of her current research, research that highlights narratives about walking, the idea of techno-ableism, techno-optimism, and the experience of disability. She has had the pleasure of presenting this work at both scholarly and community venues, but much of it has yet to be published and shared more widely. She keeps her teaching website on this topic at techanddisability.com. Ashley’s research ties into her community work and outreach. She serves as the chair of the board for her community’s Disability Resource Center, co-founded the Disability Caucus at Virginia Tech, and is a Certified Peer Visitor forthe Amputee Coalition of America. She is also a board member for the Society for Philosophy and Technology.